Drag & Drop tasks easily with the kanban view. Group tasks by stages, responsible, deadline, etc. Change name of "tasks/issues". Change the meaning of the green/red status. Create specific stages per project. Define the process through custom tool-tips for each stage. Create tasks from sales orders. 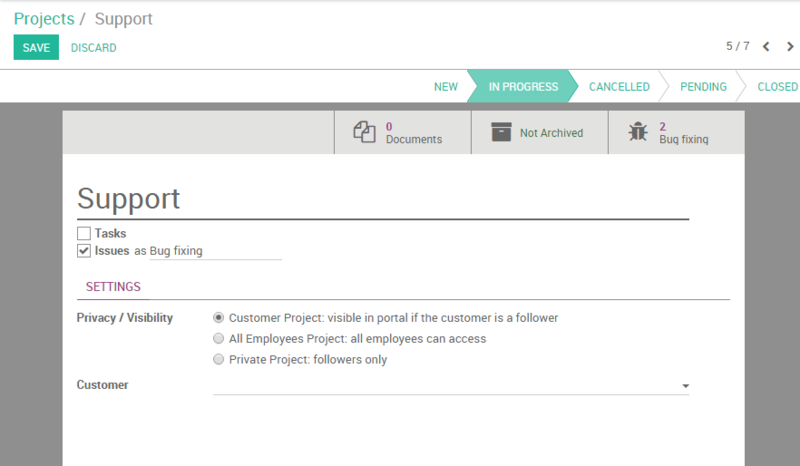 When your project is correctly set up and saved, you will see it appearing in your dashboard. Note that an email address for that project is automatically generated, with the name of the project as alias. If you cannot see the email address on your project, go to the menu Settings ‣ General Settings and configure your alias domain. 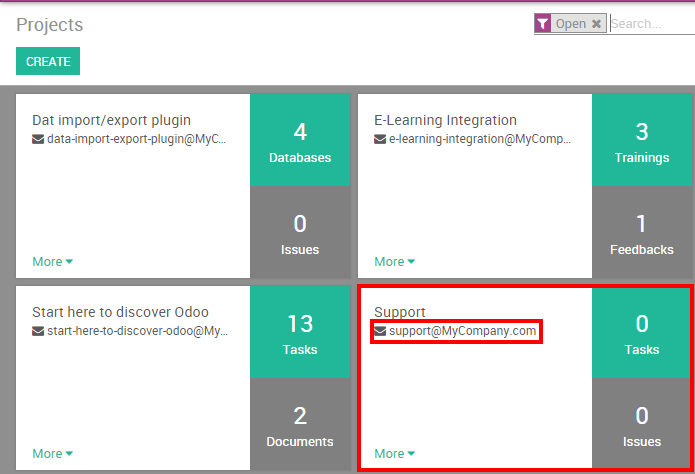 Hit Apply and go back to your Projects dashboard where you will now see the email address under the name of your project. Every time one of your client will send an email to that email address, a new issue will be created. Go to the stage settings (click on the gear icon on the top of the stage column, then select Edit). Choose the e-mail template that will be used. You can directly edit it from there. The customer just has to click on a smiley (Smile, Neutral or Sad) to assess your work. The customer can reply to the email to add more information. It will be added to the chatter of the task. Once the product is set up, you can create a quotation or a sale order with the related product. Once the quotation is confirmed and transformed into a sale order, the task will be created. The Kanban view is a post-it like view, divided in different stages. It enables you to have a clear view on the stages your tasks are in and the ones having the higher priorities. The Kanban view is the default view when accessing a project, but if you are on another view, you can go back to it any time by clicking the kanban view logo in the upper right corner. Get statistics on your issues to analyze the performance of the customer service team. You have a brief summary on the satisfaction in the upper right corner of the project.